Wendy and I both enjoy nature, but our new home-state of West Virginia has really afforded us the opportunity to exploit this interest more than ever before. There's wonderful motorcycle riding, kayaking, hiking and more right outside our front door! 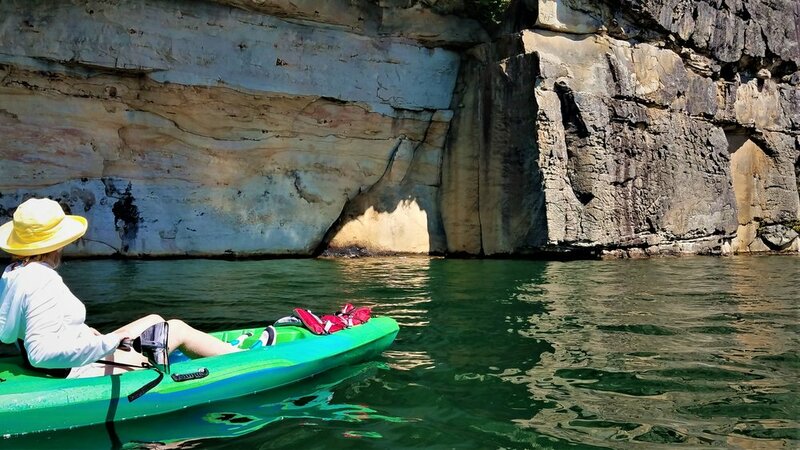 But Labor Day weekend we expanded our horizons slightly and got the kayaks out to Summersville Lake (about a 45-minute drive from where we live in Beckley). Saturday we started at Muddlety Creek off Highway 39 quite a bit North of the main part of the lake. This was a quiet, paddle-only put-in allowing us to avoid the commotion of the motor boat put-ins nearer the lake. We had a quiet, enjoyable paddle down the river until we found an inviting swimming area. I passed my cell phone, hat, shirt and sunglasses to Wendy and tipped myself out of the boat! It was a glorious, refreshing swim in the comfortable water. I climbed back into my kayak and we paddled on. We found little motivation on Sunday, but were re energized for another trip on Monday and wanted to take advantage of the good weather while we still could. We loaded up the Kayaks again and this time headed out to the put-in off Salmon Run road nearer the main part of Lake Summersville. There were more people for sure, but it was another wonderful trip with even better swimming areas! We found our own rock to beach the kayaks, stripped down to our swimming suits and took another cooling plunge in the clear water. When we were ready, we loaded up, paddled out a little farther, then decided to head back to beat the storm which never materialized anyway. 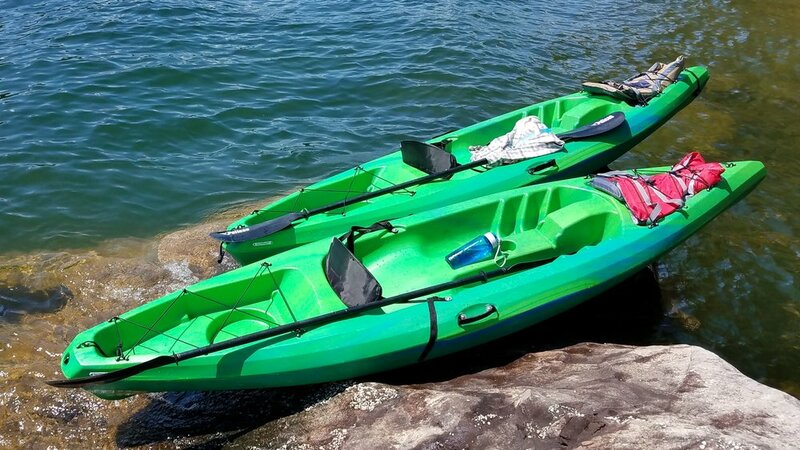 Now we're thinking of buying two more kayaks for friends and family to enjoy with us! Whew! The last few days have been busy! Last week I answered a call to action from David Sibray (Publisher at West Virginia Explorer and President of Sibray Marketing & Public Relations) to capture images of nearby Beaver, WV to cite in the travel guide. Since I'm still in the beginning stages of my "drone" business I offered to create a video giving me the opportunity to continue to learn, build my portfolio and make new contacts. I got on my motorcycle and set out to Beaver three days in a row to capture images and video with my drone and still camera. Every time I thought I was finished for the day I found something else to photograph. One of the highlights was my attempt to capture aerial images of the National Mine Health and Safety Academy. Being a government facility, this is a secure location, but the security guards, receptionists and management I met there were exceptionally accommodating and polite. I felt this important facility should be included in the video, but understandably was not given permission this time. Another part of the problem is the close proximity to the airport. With more planning I'm sure future arrangements can be made, but I am thankful for the Academy for considering my proposal. Well, I'm editing the video now and I hope it lives up to David's expectations. In the meantime, you can visit West Virginia Explorer at wvexplorer.com. Wendy and I took a fifteen-minute drive over to the YMCA soccer field complex where we walked the Gray Flats North Trail. At the last second I decided to toss my drone over my shoulder to see if I could get any video. It was plenty scary maneuvering my drone through the trees and brush over the cliff up over the gorge, but managed to get a couple seconds of interesting video. Not my best production, but something to have fun with. I came upon the town of Mabscott while on a leisurely motorcycle ride. I found the repurposed, industrial-type buildings interesting - not to mention the winding, hilly streets typical of all the towns around here. One building in-particular - the one with the rusty scaffolding affixed to the roof (possibly used to mount a billboard?) - caught my eye and I just HAD to get a video of this! Secretly touring through Mabscott I gained an admiration and respect for this town. Unfortunately, only a sliver of Mabscott can be captured in my approximately three-minute video. Capturing video and images at the Summersville Lake lookout provided several challenges, beginning with the hike back. A two-mile hike on a relatively easy trail is normally no problem. But my idea was to make it an easy run all the way . And the weight of a drone, three battery packs and a large water bottle stuffed into my backpack made the run more of a challenge than I estimated. In spite of the wonderful weather, it was only a few minutes before I decided to take it slow and enjoy the scenery along the way! Once to the lookout, the next challenge was finding a suitable takeoff and landing zone for the drone. I found an approximately 2’ x 2’ area nestled in between the roots at the base of a tree. Normally, standing near the edge of a slanted cliff approximately sixty feet above the water wouldn’t pose too much of a problem. But dividing my attention between the drone, the video monitor and maintaining my footing did make it more of a challenge! I captured some good video and images, but I wanted more and the wind was starting to come up, so I quit while I was ahead, packed up my drone and made the hike out. I then proceeded over to the dam at the Gauley River for my next shoot. Same as filming from a cliff tens of feet above the water, flying my drone over rapids down in a valley was also no picnic. But I captured a few minutes of video, attempted some new maneuvers and decided to call it a day. In the end, I was able to splice together a few minutes of interesting video, but I'll do it again and make an ever better one!